In this real-time capture, Octane 4’s AI Denoiser and AI Light system are working together to clean up the Italian room at just 50 samples, and the new scene graph, powered by Brigade, instantly moves high-poly objects on the city streets. OctaneRender® is the world’s first and fastest unbiased, spectrally correct GPU render engine, delivering quality and speed unrivaled by any production renderer on the market. OTOY® is proud to advance the state of the art once again with the release of OctaneRender 4™ – available now – with groundbreaking machine learning techniques, out of core geometry support and massive 10-100x speed gains in the scene graph. 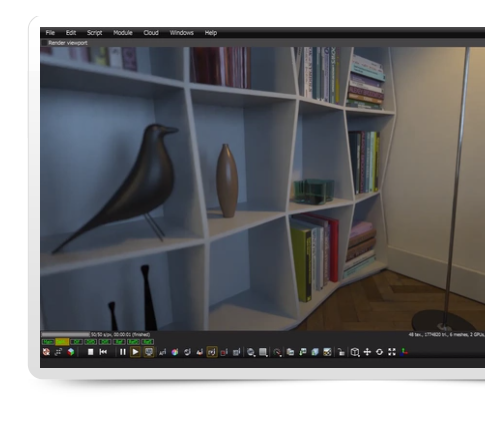 OTOY’s real-time path-tracing game engine ‘Brigade’ has been integrated into OctaneRender 4, making heavy scene loading and interactivity up to 10x to 100x faster. Brigade gives artists instant game-engine like feedback in the Octane viewport while moving or deforming heavy meshes with millions of triangles. OctaneRender 4 can render fast out-of-core geometry entirely from CPU memory, with minimal speed loss and viewport lag (even across multiple GPUs) – a first for an unbiased GPU renderer. Accelerates light sampling, tracking emissive points in real-time with up to 6-10x speed gains in scenes with many small light sources such as multi-point or spot lights. OctaneRender 4 introduces groundbreaking machine learning technology to interactively denoise beauty and AOV passes on-the-fly, both in the viewport and for final frame production rendering. Unlike other post-processing denoisers, the Spectral AI denoiser operates on internal perceptual models and scene data deep in the engine. Domain specific AI denoisers help with volumetrics, glass, refractions, SSS, depth of field and motion blur, reducing render times by 50-100x in noisy scenes. Read more for a deep dive of all new features. Ready to purchase? Online payment with digital delivery. Like what you see? Try Octane free! OctaneRender is fast and powerful. Take a look at the full list of features it supports. OctaneRender produces stunning images. Take a look at some of our favorite renders.